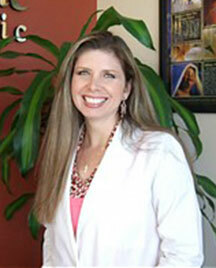 Dr. Elise A. Rio, B.S., D.C.
Hello! I am Dr. Elise Rio and have 20 years of Chiropractic experience helping people regain their spinal health including care of difficult, chronic cases and acute injuries with great success. My education includes a Bachelor of Science Degree (B.S.) in Human Biology and a Doctor of Chiropractic Degree (D.C.) from Los Angeles College of Chiropractic. I regularly attend educational seminars on chiropractic, orthopedic, pediatric, nutrition, sport and car accident injuries to keep current on the latest advances in health care in order to provide my patients with the greatest care possible. I also speak Spanish fluently. I will provide you with a comprehensive consultation; examination and x-rays (if necessary) to determine the best Chiropractic care for you. Whether it is a gentle manual adjustment or a gentle Activator adjustment, it will be just right for you! Gentle, compassionate care in a timely manner. I believe that the highest compliment I can receive from a patient is the referral of a family member, friend or co-worker. That is why Rio Chiropractic is built on referrals!